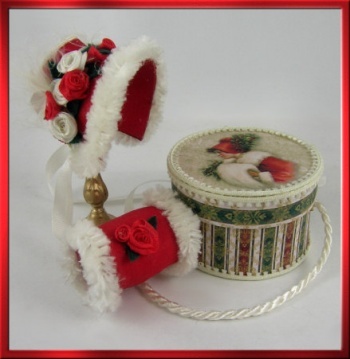 Our December project was a darling red silk winter bonnet and muff with matching hatbox. The bonnet is trimmed with red and white silk ribbon roses, and white faux fur, as is the matching muff. The coordinating hatbox includes a choice of two different artwork designs.